In heavy machinery, ships, and buildings, extensive frameworks and intricate angles may be composed of many kilometers of welded joints. Among them, fillet welds are used to join corners, Ts. and lap joints because they are more economical than groove welds. That is, fillet welded joints are simple to prepare from the standpoint of edge preparation and fit-up. 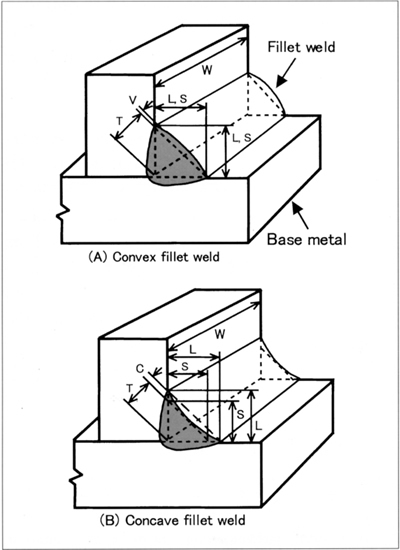 The strength of a fillet weld is based, in the design, on the product (effective area of the weld: T x W) of the theoretical throat (design throat thickness) and effective weld length as shown in Fig. 1. 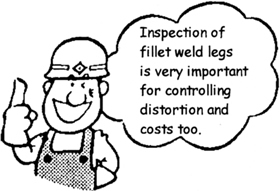 Fillet weld legs determine fillet weld sizes. 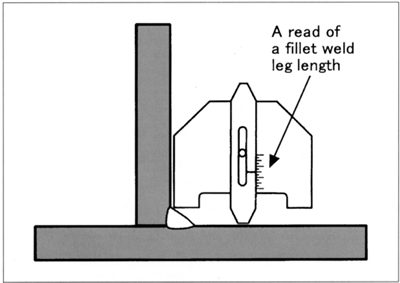 Fillet weld sizes are measured by the length of the legs of the largest right triangle that may be inscribed within the fillet weld cross section. Fillet weld sizes determine theoretical throat. 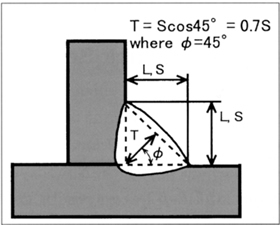 The product of the size and cos45° in case where an isosceles right triangle may inscribe within the fillet weld cross section: S x cos45° = 0.7S, as shown in Fig. 2. Fillet weld sizes must be large enough to carry the applied load, but the specified fillet weld size should not be excessive to minimize welding distortion and costs. AWS Dl.l (Structural Welding Code ― Steel) specifies the minimum fillet weld size for each base metal thickness: e.g. 6-mm size for thickness over 12.7 up to 19.0 mm. AWS Dl.l also specifies the maximum convexity, because excessive convexity may cause stress concentration at the toes of the fillet weld, which may result in premature failure of the joint. In quality control of fillet welds on actual work, leg or size, throat, convexity, and concavity are inspected by using several types of welding gages. Fig. 3 shows a multipurpose gage measuring a fillet weld leg.